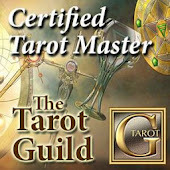 Tarot Dactyl: Thanks For a Great Memorial Day Weekend Tarot Celebration! Thanks For a Great Memorial Day Weekend Tarot Celebration! Thanks to all who participated in the Memorial Day Weekend Tarot Celebration. I feel blessed that I got to read for so many wonderful people! And the most requested deck??? Drum roll.... Deviant Moon! We'll definitely have to do this again on another long weekend. Interesting! I'm not the world's greatest photographer, but that's the 7 of Cups-2 of Wands-High Priestess. Hmmm, it's like the difference between our outer daydreams and inner vision. Ooh, like knowing the difference between our fantasies and our true visions and there's a fork in the road, a choice to be made. On the left the path leads to illusion and fancies which may or may not have any substance and on the right to inner wisdom and hidden truths. The fire is dividing the waters. You have the key to unlock the mysteries within you. When the clouds clear at the end of this week, will it all dissipate into a thin haze or will you be left with an understanding that you can't put into words? Ask yourself, Was I daydreaming or did I follow my dream? 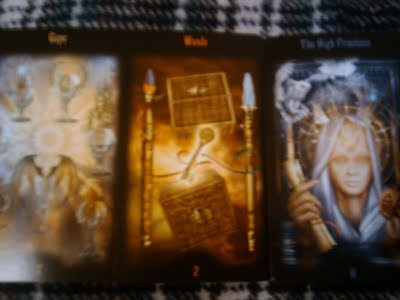 Interestingly enough, when the High Priestess appears with the 2 of Wands in a spread it can sometimes mean that it's time to act boldly. Well, that's something to think about. Would love to hear your thoughts on what the spread meant to you this week.